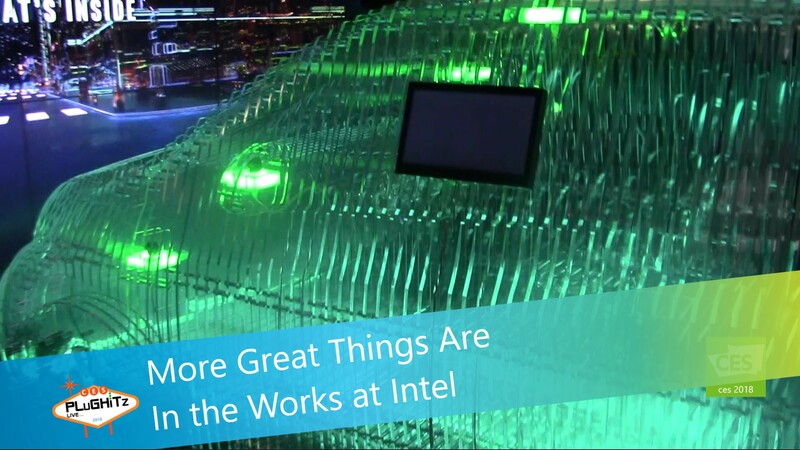 There is always so much to see inside the Intel booth at CES: the innovation, the creativity, the collaboration. It's basically a universe all unto itself and it's so much fun to dive in and explore. While there, we came across this really cool translucent, known as The Inside Autonomous Experience. It is basically demonstrating and representing what people can expect in 2021 in terms of the types of hardware that will be used for the sensors in autonomous vehicles. This display vehicle has a total of 23 sensors on it. There are 11 cameras, 7 radar sensors, 3 LiDAR sensors and 2 ultrasonic sensors. Intel and partners can use the sensors as part of the autonomous experience, and can also collect the data and information on the vehicle to improve performance. To make it even more awesome, Intel has recently acquired Mobileye, a market leader in advanced driver assistance systems. They are combining forces to make the next level in autonomous driving a reality. Through this partnership they can leverage Mobileye's hardware and cameras as the eyes of the vehicle and Intel as the brains. This not only frees up both entities to give their attention and expertise to their own portion of the project, but also, when they come together, they can make autonomous driving safer and more affordable. These are two very important factors for moving forward in this industry. When can we expect to see more than an acrylic representation of this wonderful technology? Well, Intel is doing what they do best: using their technical and computing expertise to creatively innovate next level products and then analyze the data to produce a final product that far exceeds our expectations. We can't wait to see how this project evolves between now and 2021.